Home » Homogenous vs. Homogeneous – What’s the Difference? If you are describing a society that is made up of very similar people, would you describe this society as homogenous or homogeneous? Despite their spelling similarities, these words are not synonyms. One is an outdated term from biology, while the other is an adjective that refers to sameness. They are confusing enough that even professional journalists often misuse them. You, however, are a discerning writer, and you understand that proper word choice can preserve your credibility. This article will explain which of these words is correct in your writing. What is the Difference Between Homogenous and Homogeneous? 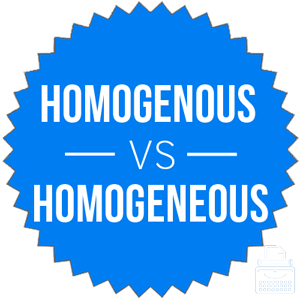 In this post, I will compare homogenous vs. homogeneous. I will include example sentences for each word, so that you will be able to see their correct usage in context. Finally, I will show you a mnemonic device that makes it easy to choose homogenous or homogeneous in your own writing. What does homogenous mean? Homogenous (pronounced huh-mah-je-nus) is an outdated biological term that refers to organs or body tissues with genetic similarities. Today, most scientific writers would use the more recent term homologous instead. Still, if you are reading older scientific texts, you might run across homogenous from time to time. The host body rejected even the homogenous tissue implants. The usual mistake with these words is to use the word homogenous when the writer really means homogeneous. Since homogenous is declining in use, even in the scientific community, this should be an easy error to avoid. What does homogeneous mean? Homogeneous (pronounced hoh-muh-jeen-ee-us) is an adjective. It is not a synonym for homogenous, despite its spelling similarities to that word. Homogeneous means having similar or uniform characteristics. A community where most members share similar characteristics, e.g., a biker gang composed of low-income males in their 20s and 30s who all have similar tattoos, could be said to be homogeneous. A box of crayons that only contains blue crayons would also be homogeneous. Cake batter starts as a collection of disparate ingredients, but soon becomes a gooey, homogeneous mixture. Sales figures for existing branches vs new branches are remarkably homogeneous; there are no statistically significant differences between branches during the most recent quarter. Homogeneous has appeared in English since the 17th century. It is somewhat unique in that its etymology can be traced through both Latin and Greek. It should be pronounced with five distinct syllables, hoh-muh-jeen-ee-us. The associated noun for homogeneous is homogeneity, and its verb is homogenize. You will likely have seen milk labels advertising the product as homogenized. Homogeneous also has an antonym, heterogeneous, that means having dissimilar characteristics. These words have different pronunciations, and pronouncing each word correctly is key to using the correct word in your writing. How to pronounce homogenous: The pronunciation of homogenous (huh-mah-je-nus) has four syllables. How to pronounce homogeneous: The pronunciation of homogeneous (hoh-muh-jeen-ee-us) has five syllables. Homogeneous, along with its antonym, heterogeneous, both contain more syllables than homogenous. Unless you are a 19th century biologist, you should avoid using homogenous. Today, scientists would be more likely to use homologous in place of this archaic term. For all situations where you need to describe something as having similar or uniform characteristics, choose homogeneous. Homogeneous vs. Homogenous Check: Since homogeneous has an extra E, like the word characteristics, you can remember that homogeneous describes similar characteristics. Is it homogeneous or homogenous? Homogenous is an older scientific term that describes similar tissues or organs. It has been replaced by homologous. Homogeneous is an adjective that describes similar or uniform characteristics. Homogeneous is still used in modern writing. 1 What is the Difference Between Homogenous and Homogeneous?